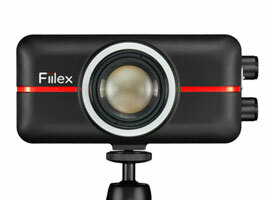 Fillex proudly announces three innovative LED lights at CineGear L.A. 2013. Following a highly successful brand launch in January 2013 and the introduction of 2 groundbreaking specular LED sources, Fillex has quickly been recognized for its ability to deliver compact, powerful, and color-tunable LED lights. 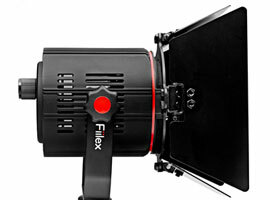 With the release of three more uniquely designed lights: a small 12W battery powered source, a lightweight 40W mobile ENG illuminator, and a powerful 160W intelligent light, Fiilex is on the way to generate more excitement in the image capture industry and lead the way of the specular LED revolution. In a market flooded with an overabundance of low-power on-camera LED panels that produce broad, soft and unshapeable light, the P100 enters the market as an intense specular source that can throw light further into the distance as well as be shaped. Equipped with a 12 Watt Dense Matrix LED array, the P100 puts out at least twice the amount of light than most of the 3-6 watt on-camera LEDs. Included in the design is a focusing lens that can be rotated to modify the beam angle (30 -54). Powered by a proprietary li-ion battery, a fully charged P100 will last for more than 2 hours at maximum light output. Similar to other Fiilex products, P100 comes with continuous color tunability (3000 - 5600 K) and intensity control (30 – 100%). The P180E is a portable light created for the field staff in the newsgathering and broadcast community. At merely 300 grams in weight and about the size of an 8 oz soda can, consuming up to 40W max power, this light is small yet packs a powerful punch. The color tunability (3000 - 5600 K) and intensity control (30 - 100%) allow camera operators to quickly adjust their lighting to match the environment, including filming continuously from outdoor to indoor. With a 10 - 28V DC input voltage range, P180E can be powered by most standard professional batteries used in the broadcast industry. 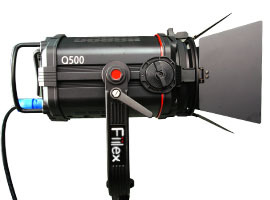 The first light in the Fiilex Quasar Series is the Q500, designed with increased power and functionality. Consuming 160 watts of power, the Q500 is a powerful light and technological marvel. Created with the latest Dense Matrix LED by closely packing more than 100 high power LED chips, the Q500 produces a smoothly mixed spectrum of light that can be shaped easily by a 5" glass fresnel. The Q500 has a knob for intensity control, a knob for extended range color tuning (2800K to 6500K), and an additional knob for hue adjustment (shifting between Green and Magenta). This new light can also be managed via DMX interfaces (both XLR and RJ45), making it an ideal light to use in a studio setting. We welcome you to visit us at booth S327 at the 2013 CineGear Expo Los Angeles. It is happening at The Studios at Paramount, exhibits are open from Friday May 31st, 2pm-9pm and Saturday June 1st 10am-5pm.